A second goal in the week from striker Paul McManus earned City a draw at Luton Town on Saturday. McManus headed home a Ryan Lowe free-kick 13 minutes from time to the delight of the 212 fans who made the trek to Kenilworth Road. The point lifts Chester to 13th in League Two and stretches their unbeaten run to five matches. City had fallen behind four minutes before the break through a well taken half-volley from Asa Hall after the City defence had failed to cut out a right wing cross. Both sides had chances to win the game with Kevin Ellison spurning a couple of opportunities earlier on and the home side came close on several occasions throughout the 90 minutes but couldn’t beat a resolute John Danby. The Blues best chances late on fell to their substitutes. Anthony Barry who saw a great volley headed away off the line and the Blues almost snatched all three points with the last kick of the match as Jay Harris saw a 20-yarder fly agonisingly inches wide. City had been reduced to ten men just before the final whistle as Kevin Roberts picked up his second yellow card of the game. The youth team lost at home 2-1 to Wigan Athletic on Saturday and remain next to bottom of the Youth Alliance League. 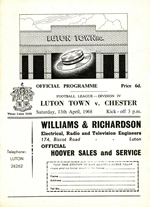 Chester travel to Luton Town tomorrow aiming to end the month unbeaten. The Blues have won two and drawn two of their last four matches, a run that has lifted them to mid-table, and coincided with the appointment of assistant manager Wayne Allison. The Hatters have picked up ten points so far this season, two more that City, but still lie bottom of the table following their 30 point reduction at the start of the season. Games between the two sides are few and far between. They last met on 29 January 1977 in the fourth round of the FA Cup. A crowd of 10,608 were at Sealand Road to see a nostalgic return to Chester of the Futcher twins Paul and Ron. They had been sold to Luton Town in the summer of 1975 for a combined fee of £125,000. Alan Oakes had an inspired match for Chester who began to take control as the game went on. With the tie moving into injury time and looking to be heading for a replay Billy Dearden crossed from the right wing straight to an unmarked Ian Edwards who made no mistake from eight yards to shoot past Alekscic. As Edwards celebrated the dramatic late winner, a section of the Kop wall right behind the goal (where most of the visiting fans were standing) collapsed with supporters spilling onto the pitch. Fortunately there were no serious injuries. The win gave City their first ever foray into the fifth round of the competition. You have to go as far back as 1967/68 for the last league meeting between the sides in Division 4 (programme pictured). A Les Jones goal couldn’t prevent a 2-1 defeat at home while the two sides fought out a 0-0 draw at Kenilworth Road in front of 13,266. The Hatters were promoted as champions at the end of the season. The sides also met in 1966/67 with a 0-0 home draw and a 0-1 away defeat, and 1965/66 a thumping 2-5 defeat at Luton followed by a 1-1 draw at Sealand Road in the last game of the season. 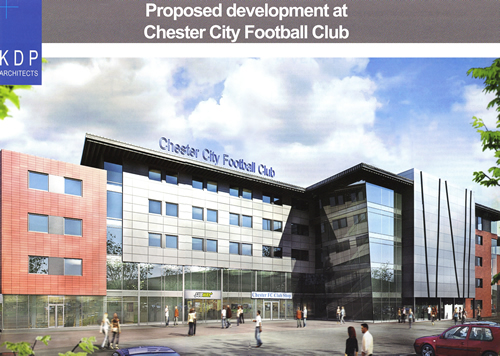 The club have revealed ambitious plans to redevelop sections of Deva Stadium. For the last nine months the club have been working alongside Liverpool based company Property First Asset Management Ltd (PFAM) in an effort to maximise more the potential of the ground. The plans show a major redevelopment on the main East stand that would include: Four Tier Stadium, 40,00 square foot office facilities, gymnasium, cafe and bistro, club shop, players and sponsors Lounge, new entrance, redeveloped stands as well as new retail outlets. The club say should they be given planning permission from the Council soon then they would hope that work could start as early as January 2009. A smartly taken goal three minutes before the interval from Paul McManus brought City a point from this keenly contested match. A fine build up involving Man of the Match Mark Hughes and Ryan Lowe fed McManus who flicked the ball over Shrews ‘keeper Luke Daniels at the near post. City had to weather a lot of early Shrewsbury pressure and had fallen behind in dubious fashion on 28 minutes. Referee Mark Halsey, himself the centre of controversy last week, overruled a linesman and awarded the visitors a penalty following a tackle in the area by Stephen Vaughan on ex-City midfielder Ben Davies, Grant Holt scored from the spot-kick. This was the fifth penalty already conceded in seven league games this season. City face another test on Saturday when they make their first visit to Kenilworth Road in 40 years to play bottom side Luton Town. The Hatters are currently bottom of League Two having started the season with their much publicised 30 point reduction, a tally they’ve now reduced by ten. The youth team lost their latest league match 2-1 at Tranmere Rovers today. EXILES WANT TO HEAR FROM YOU! This season is another reason to celebrate for the Exiles as we are 25 years old in November. One of our plans is to produce a book, at the end of the season, with reminiscences of watching the Blues over the last quarter of a century from the Exiles and other fans as well. This will only be possible with your contributions, so if you have any good stories, whether they be funny, sad or just interesting we would love to receive these reminiscences from you. Perhaps memorable days out, meeting the players or management (Harry of course!) etc; As well as stories we would also welcome any photographs you may have from following Chester over the last 25 years. Please email your stories to stories@chestercityexiles.co.uk but if you are unable to send these electronically, please pop them in the post to Steve Mansley at the address on the Exiles committee page. We will keep you posted on how this project develops. Chester entertain Shrewsbury Town on Sunday looking to extend their three match unbeaten run. The Blues have taken seven points from the last nine available, scoring nine goals in the process of beating both Barnet and Grimsby and forcing a draw against Bury. Skipper Paul Linwood who has a hamstring injury is expected to be fit, while there are doubts over Laurence Wilson and Paul Taylor, though the latter played in the reserve friendly against Wrexham in midweek. Tickets for the match against Shrewsbury Town on Sunday are still available from the Deva Stadium ticket office and the club shop in Watergate Street from 10:00-16:00hrs today. They will also be on sale at Deva Stadium tomorrow (Saturday) from 10:00-12:00hrs. Shrewsbury fans have been given the south terrace and west stand seating. The game will kick-off at 12:00hrs. Manager Simon Davies has injury concerns over three players ahead of Sunday’s noon all-ticket clash with Shrewsbury Town. Captain Paul Linwood has a slight hamstring problem, Lawrence Wilson still has a calf injury picked up against Bury and Ryan Lowe is struggling with illness. In a behind-closed-doors friendly in the rain at Colliers Park yesterday a Chester reserve side beat Wrexham Reserves 3-2. 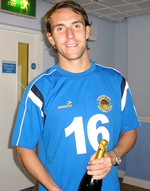 Paul Taylor, recovered from food poisoning that kept him out of the win at Grimsby, gave the Blues the lead on 17 minutes an advantage they held until the interval. The home side started the second period well and equalised through Marc Williams in the opening minute, fifteen minutes from time the same played gave Wrexham the lead. But the Blues fought back well scoring twice in the final twelve minutes through Ryan Williams and Lloyd Ellams to record a victory. City fielded two trialists in the match, defender Simon Grand and goalkeeper Alex Bentley. A superb hat-trick, his first ever in the League, from Kevin Ellison brought City a 3-1 victory at Grimsby Town on Saturday. Ellison is the first player since March 2006 to score a treble, Derek Asamoah netting three at Boston United on that occasion. The win lifts the Blues to 14th in League Two. Ellison scored his first after just three minutes, shooting past Phil Barnes following a Ryan Lowe through ball. The Mariners drew level after the break and dominated for long periods in the second half. John Danby kept City level with a fine display in goal. However with 12 minutes remaining Ellison put City ahead with a stunning curling free-kick, following a foul on Damien Mozika, and sealed the points five minutes from time with another great finish following a pass from Mozika. The dying minutes were full of action with Danny Boshell missing a penalty for the home side and City twice hitting the woodwork through Mark Hughes and substitute Paul McManus. Two late casualties for the match were Laurence Wilson who massed out with a calf injury and Paul Taylor who had food poisoning. City named 17-year-old Ryan Williams as one of their substitutes at Blundell Park. The Birkenhead born player was a member of last year’s youth squad. The club have announced that two more French players with Championat experience will train at Chester next week and possible take part in a behind closed doors friendly. The Blues signed Damien Mozika (left) from AS Nancy after a trial period in the summer and the midfielder has been turning in man-of-the-match performances ever since. Earlier this week the club turned down an offer from an unnamed Championship side wanting to take the 21-year-old on loan. City travel to Grimsby Town tomorrow and are likely to have Kevin Ellison and Laurence Wilson fit after both took knocks in last weekend’s 1-1 draw with Bury. Manager Simon Davies is expected to name an unchanged side. The Mariners, who welcome back Robbie Stockdale and ex-City defender Richard Hope, lie two places below the Blues with two points secured this season from draws against Lincoln City and Chesterfield. Tickets for the match against Shrewsbury Town on Sunday 21 September are still available from the Deva Stadium ticket office and the club shop in Watergate Street from 10:00-16:00hrs Monday-Friday. Shrewsbury fans have been given the south terrace and west stand seating. The game will kick-off at 12:00hrs. 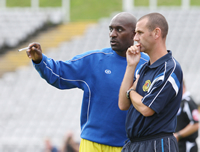 Wayne Allison has been appointed assistant manager on a permanent basis. He has been helping out manager Simon Davis since his predecessor Huw Griffiths was sacked following the Leeds United game. Yorkshire-born Allison began his playing career in 1987 as a trainee at Halifax Town before moving on to Watford, Bristol City, Swindon Town, Huddersfield Town, Tranmere Rovers, Sheffield United and Chesterfield. The Blues fought out a deserved 1-1 draw with unbeaten opponents Bury at Deva Stadium on Saturday. City had the better of the opening period and took the lead seven minutes before the interval with a delightful goal from French midfielder Damien Mozika who slotted home pas ex-City ‘keeper Wayne Brown after being set up by Ryan Lowe. Brown went on to deny both Lowe and Paul Taylor in the opening period. After the break the Shakers came more into the game and dominated for periods. They equalised just after the re-start when Paul Linwood was adjudged to have fouled Andy Morrell. Andy Bishop scored from the spot-kick into the bottom corner, just beating the dive from John Danby. Manager Simon Davies was forced to replace the injured Laurence Wilson with Shaun Kelly as City regrouped. It was the visitors who had the better chances to win the game with Bishop and Glynn Hurst both going close. Chester have been given a home tie against Morecambe in the second round of the Johnstone’s Paint Trophy, the game will be played on Tuesday 7 October. The match will kick-off at the earlier time of 19:00hrs. City received a bye in the first round while the Shrimps beat League One high-flyers Oldham Athletic 5-4 on penalties after the sides had drawn 1-1 at Boundary Park. Admission will be £10.00 for adults, while senior citizens and under-16s will be admitted for £5.00. Juniors under 16 years of age who attend the game with a paying adult will be admitted to the ground free of charge if they acquire a special ticket from the Deva Stadium office prior to the match. City manager Simon Davies will be hoping to name an unchanged squad for the visit tomorrow of Bury following last Saturday’s thrashing of Barnet. The Shakers boast an unbeaten start to the league two campaign and sit third on goal difference. Away from Gigg Lane they have won at 3-1 at Chesterfield and drawn 1-1 at near neighbours Rochdale. Davies’ counterpart at Bury Alan Knill also looks set to name an unchanged team for the match. The home game against Shrewsbury Town on Sunday 21 September, kick-off 12:00hrs, is all-ticket. Tickets for the match will go on sale from tomorrow and all next week at the Deva Stadium ticket office and the club shop from 10:00-16:00hrs. They will also be available after Saturday’s home game against Bury. Shrewsbury fans have been given the south terrace and west stand seating. Chester have circulated clubs telling them that experienced duo Paul Butler (pictured left)and Tony Dinning are available for temporary loan. Neither player features in manager Simon Davies’ plans and managing director Rob Gray believes their experience could be utilised elsewhere. Between them both Butler and Dinning have played in over 1,000 league matches. City’s season finally got up and running on Saturday following their comprehensive second half demolition of Barnet at Deva Stadium on Saturday. Kevin Ellison got the scoring underway in the opening period to give the Blues a one goal advantage, and it could have been more, at the break. Second half goals from captain Pail Linwood, Kevin Roberts and a brace from Ryan Lowe though swept the Bees aside. The visitors, who have still to win this season, did score a consolation goal through Cliff Akurang in added time. The win lifts City to 16th place in League Two ahead of Saturday’s visit from third placed Bury. The Shakers, with three wins and a draw from their opening games, should provide a much sterner test for Davies’ squad who will at least be buoyed following their first three points of the campaign. The youth team were beaten again on Saturday this time at home by Stockport County. 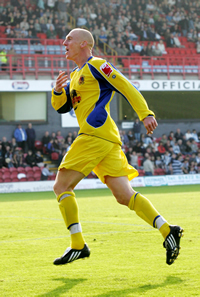 Chester took the lead on 38 minutes through Frazer Ablett. Eight minutes after the break Kyle Wilkie equalised for the Hatters from the penalty spot. The visitors were awarded another spot-kick which Robert Vincent converted. The Blues fought back and Kristian Platt scored the equaliser but it was the visitors who had the last laugh as Rick Ratcliffe scored the winner fifteen minutes from time.